Posted by Teresa Mihelic HelpDesk on Thursday, August 2nd, 2012 at 2:22pm. We have been talking these past days about how the beach communities in Orange County have been helding this wonderful free concerts at the park. 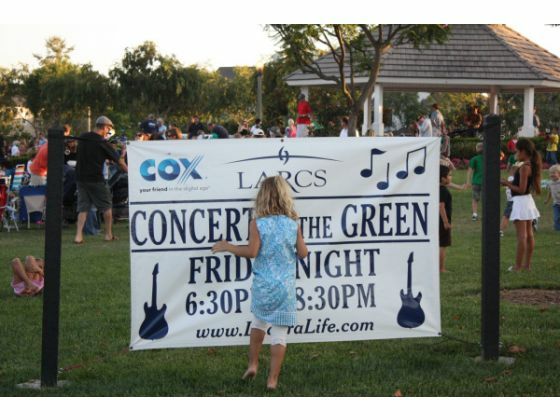 Well, this time we need to talk about Ladera Ranch, who's wonderful community also offers Free Summer Concerts! Many of Ladera Ranch residents danced to the beat with the reggae band Common Sense, last Friday afternoon, enjoying the second show of Ladera Ranch's Summer Concert Series. The free concerts are held 6:30-8:30 p.m. on Friday at the Town Green, 25612 Crown Valley Parkway. Concert-goers are welcome to bring chairs and picnics along with cash to enjoy treats provided by concession stands at the event. Tomorrow's concert features Stepping Feet, playing Dave Matthews. Upcoming concerts feature No Duh performing a No Doubt tribute on Aug. 10 and the 80'z All-Stars playing 1980s music on Aug. 17. The Aug. 17 concert will be held at Founder's Park. Bring your low back chairs, blankets, and picnics. Please do not bring umbrellas/shade covers and no pets are allowed during the concerts. If you can't wait to live in Ladera Ranch and enjoy these type of community activities, you need to call us to start getting the email updates, or go to our Ladera Ranch Real Estate page where you can see all the homes and condos available and listed in the MLS in Ladera Ranch.